Discover the Mulberry sale at mulberry.com including women's bags, men's bags, accessories and womenswear. Nothing says perennial British chic like Mulberry. The tree logo has come to represent style, class and luxury across the globe, and the famous handbags have been spotted on the arms of celebrities, royalty and fashionistas alike. From the classic leather 'Bayswater' tote, to the functional but cool 'Alexa' satchel; Mulberry just keeps changing the rules by launching It Bag after It Bag in an array of colours and fabrics. True Mulberry addicts won't stop with a bag - the fashion house offers a wide range of on-trend accessories, including belts, wallets, phone covers, shoes and keyrings. Show off your style credentials with an instant classic from this most British of labels. 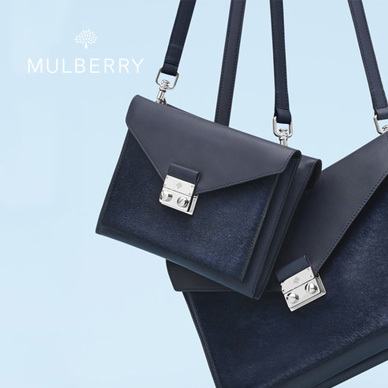 Add Mulberry to your Favourites list and be the first to know every time they have a Sale on! 1st January 2018 - Mulberry New Years Day sales for 2018. 7th May 2018 - Mulberry Early May Bank Holiday sales for 2018, add to your diary now! July 2018 - Mulberry Summer 2018 sales, joining us? 23rd November 2018 - Mulberry Black Friday sales in 2018 start on Friday 24th November. Add products from Mulberry to your Love Sales list. Get the Love Sales button now! Mulberry July Sale is now on! Discover the Mulberry sale at mulberry.com including women's bags, men's bags, accessories and womenswear. Mulberry June Sale is now on! Discover the Mulberry sale at mulberry.com including women's bags, men's bags, accessories and womenswear. The Mulberry January sale is now on with upto 50% off on your favourite handbags. Save up to 50% on your favourite number. The Mulberry Boxing Day sale is now on with upto 50% off on your favourite handbags. Save up to 50% on your favourite number.